This summer I picked up a copy of the 2010 Michigan Amish Directory, which lists most of the Amish settlements in the state. Amish directories vary; some can be little more than an address listing, while others include historical background, maps, and more. The Michigan guide, like a few other directories, contains a chart listing the occupations of household heads. While the survey is not perfectly scientific, the clear winner is farming, with over 400 respondents picking this category. Farming is followed by construction-related jobs, and then woodworking (more on Michigan Amish furniture). It’s always interesting to see the less-common occupations as you go down the list. Among Michigan Amish respondents, we find one Beekeeper, along with a single Casket Maker. Seven Auctioneers responded to the survey, as did two Counselors. Two claimed “Printing” as their field of choice, four described themselves as Horse Trainers, and five work in the field of Refrigeration. A single respondent was found for each of the following: Wind Turbines, Chiropractic, Engineering, Archery, Candy Maker, Healing Care (and another for “Health”), Grain Inspector, Mail Order, Granola Mfg, and, confusingly, “Taxi” (would that be yellow horse-drawn?). This is far from the full list of uncommon Amish livelihoods. To this tally (to start) we’d need to add Bookkeeper, Health Supplements sales, Real Estate, Podiatry, and Horse Dealer, all of which are occupations you can find being practiced by the occasional Amish person in one settlement or another (If you can add any to this list, please do!). Some of those jobs sound like they require some sort of certification (especially chiropractor!) how is ts accomplished? Is it more of a title that person has given to themselves rather than being certified by any professional association? Lindsay, good question, these are more likely instances of simply practicing a service rather than being certified as a credentialed practitioner, ie, saying you do “chiropractic” work would be something different than saying you are a “chiropractor”. Though there is some apprenticeship learning, in some of these fields Amish would also take supplemental courses as well (ie bookkeeping). To answer your question about certifications, that depends on the community. It is not uncommon for the community to ‘host’ a petitioner with educational resources and costs, if the need is clear. I can point to bookbinders, well drillers, coopers, certain woodworking fields, smiths, herbalists, farriers, and one veterinarian. They need their time away too. A few years ago while visiting northern Indiana, we saw a buggy with 2 elderly men in it, pulling a pretty nice 14 ft. Al boat on a trailer. The boat looked like it had about a 10HP motor & those men appeared to be on a mission. It was an amusing sight. In one New York settlement there is an Amish man that makes dentures. An Amish friend makes timber frames and draws architectural plans that he has stamped by an engineer. Another Amish man manufactures cultured stone veneer. Great examples Tom, thanks. On drawing up construction plans, some Amish are finding computer assistance useful, but that is another gray area. do you know a way i can get a listing of these amish dentists and if there is any in pennsylvania? Sherryh, they are not going to advertise as dentists, and might be very hesitant to do anyone from a non-Plain church, for not wanting to get involved in lawsuits, etc. Got to hand it to the Amish….they are very creative in finding ways to make a living and survive in this country! And whatever they do, most are very good at what they do. We could all learn from them, in this day and age. Yes, there are more than one Amish “dentist.” The ones I am aware of are Swartzentruber. And they got in trouble and spent time in jail … for not telling where they got their Novacain from. 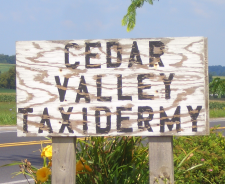 I used to taxi folks to the one in Holmes County. And usually you had to wait in line, he was only open one or two days a week. Everything was donation basis, since if he charged he would have to get a Dentist license. Making good money at 10 bucks a pop–imagine how many teeth that must be. Right–are we talking “regular” good money, or Swartzentruber good money…even if it’s just 5 a day, let’s say, that’s pretty busy, it would seem. Kind of sad, actually. To be honest, pulling teeth seems like an anachronism, a practice from another era. But a little while back I saw a program on Appalachian towns and poor dental hygiene and diets (Mountain Dew) which led to people losing their pearly whites at a very young age. One (certified, non-Amish) dentist did charity tooth work in the region out of a large mobile trailer/office. When I was at this man’s house (was there many times doing taxi work) it was always busy, like wait in line. I would guess this man did more than 2 per hour, and if you figure an 8 or 10 hour day, you could get around 30 people each day. And if some of them laid down more than $10 on the table when they left, he could easy bring in several hundred per day. Which for a Swartzentruber is really good wages since they tend to do more manual type labor that doesnt pay so well–sawmill laborer, Grade B milk, etc. Rich, great anecdote. I would need to get my courage up before I walked into Levi’s office, even if they pop out slick as a whistle! I do love the crossover potential between Weight Loss/Tooth Repair though. In Minn. there is a Vet. Yes, the Amish are quite accomplished when it comes to work and supporting themselves and families. If the younger generation in the world looked at the Amish as mentors, they would learn alot. Find out that they are not the most important things in world and that hard work really does matter and pay off! I come from the old school of life and haven’t been hurt by it one bit. Erik, I wonder, did the “taxi” mean taxidermy? Perhaps the ‘dermy’ part of the word didn’t fit in the listing. Or, maybe he takes tourists on buggy rides and that’s what is meant by “taxi”. Still, I keep picturing a bright yellow buggy with a black and white checkered strip! No SMV triangle needed! LOL! Good observation. Maybe this is just the short terminology for those in the trade. I’m just not in the know when it comes to preserving dead animals! Weight loss? I imagine that must be a challenge for an Amish person to go on a diet LOL. But it’s something I have wondered about. Now that there are more Amish moving away from labor intensive jobs into more entreprenuerial roles, I imagine those big meals would add up after a while if you’re not burning as many of those calories. You were talking about dentists pulling teeth. When I was a kid my grandfater (not Amish) use to tie string around his tooth and slam the door to get his bad teeth out. When I was real little he wanted to me to slam the door for him and I couldn’t do it even though he ordered me. Finally my grandmother came in and said she would take care of it. She took me by the hand, led me from the room and slamed the door behind us-that did the job. Lindsay—when I visited Arthur and visited an Amish grocery store, they had a poster up advertising the “Apple Cider Vinegar Diet”. I don’t know how successful it is (I’ve heard about it for years in the “English” world). I couldn’t imagine dieting, being Amish—they are (or seem to be) so much more active than we are, walking, farming, doing carpentry, hanging out clothes, gardening, canning, taking care of multiple children and animals, etc. Their food seems so tempting…yummy…how could they give it up? I agree, though, that if they have to resort to a more sedentary lifestyle, those calories (and pounds) would sure add up quickly! My father, who lived until age 93, was so frugal that I once watched him pull his own tooth with a pair of pliers. He also always cut his own hair using two mirrors so he could see the back of his head. He cut my hair, too; I dreaded the summer buzz cut that was administered every year right after school got out. I certainly learned frugality from my non-Amish father who lived through the Great Depression. Owww…anyone dreaming about “joining the Amish” might reconsider after reading this thread! And while I’m no fan of the “cosmetic dentistry” that is frequently advertised by dentist offices around me, I also believe in getting the best care possible when I need it. For me, that means seeing a top-notch, highly trained dentist who is well worth his fees. I’m surprised Amish communities don’t place more emphasis on preventative dental care. Or perhaps they do and we simply aren’t reading about it here. An ounce of prevention is worth a pound of cure, as they say. Ed, when I did taxi worked, I also hauled some to a regular dentist. But for every dentist run, I think there were at least 3 chiropractor runs. main occupation — maybe the one they make the most money at. Some examples from Amish men I’ve met: Greenhouse operator/ice delivery man; produce auction manager/outdoor furnace salesman; and farmer/harness maker/deer processor. Good point Al. In this Michigan directory, some are double-listed. Not rare to have more than one stream of income. Would they seek employment as butchers, or in the slaughter industry if it were local? Several years ago I worked in and around Arthur, IL, working for an office supply company. I became acquainted with an amish man that was rewiring electic electronic calculators to run on 12 volt batteries. However, his main occupation was rewinding electric motors. He had a diesel engine powered electical generator that would provide power for testing the motors. But, it was not used to operate the lighting in his shop–that was gas lamps. One of our friends is a farrier. The horses are brought to him. Often a man will come over in his horse and buggy with another horse, or two, tied to the back of the buggy and “drop them off” for the afternoon/overnight. Sometimes they’ll wait and help do some chores around the farm to offset the costs of the shoeing…. Another friend is a mid-wife. Will Low Milk Prices Force Amish Out Of Dairying?